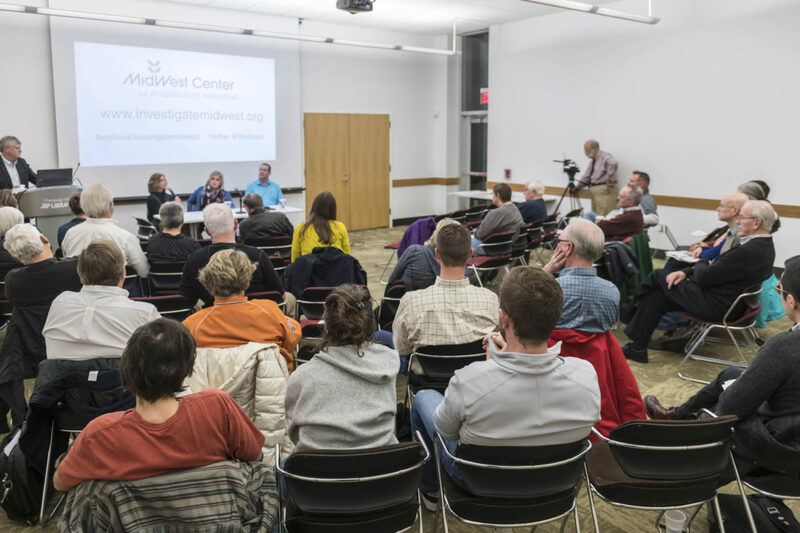 The crowd at Off-target: A community conversation about dicamba at the Champaign Public Library on February 22. 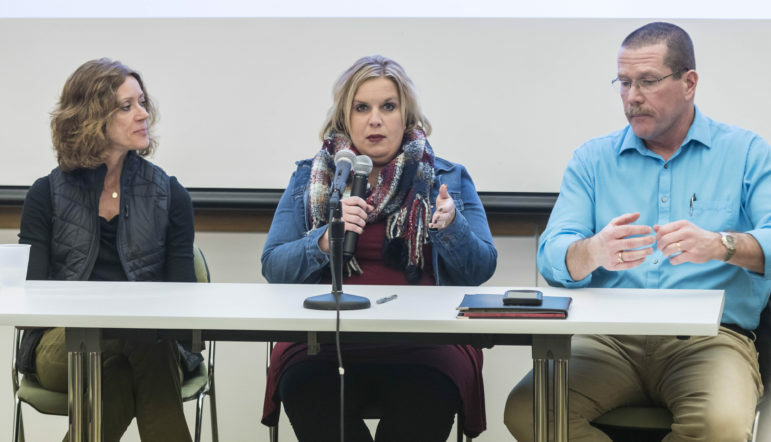 Aaron Hager, a professor at the University of Illinois, speaks at the Off-target: A community conversation about dicamba at the Champaign Public Library on February 22. 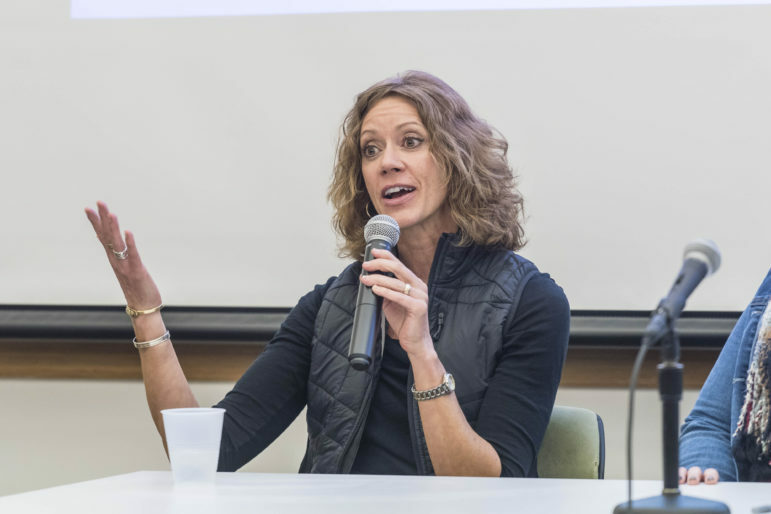 Hager spoke to a crowd of about 30 people on the topic during a Feb. 22 panel discussion at the Champaign Public Library hosted by the Midwest Center for Investigative Reporting and Illinois Humanities. See full video discussion here. Read our coverage on dicamba here. Jean Payne, president of the Illinois Chemical & Fertilizer Association, and agronomist Stephanie Porter were also on the panel. The discussion was moderated by Brant Houston, Knight Chair in Investigative and Enterprise Reporting at the University of Illinois. In 2017, the Illinois Department of Agriculture received more pesticide misuse complaints than in the previous three years combined, a review of reports by the Midwest Center for Investigative Reporting found. At least 245 of those complaints in Illinois were related to alleged off-target movement from dicamba, according to University of Missouri weed scientist Kevin Bradley. “The soybean is probably near the top in terms of how sensitive it is to exposure,” Hager explained. Dicamba made national headlines after Monsanto and BASF introduced new formulations of the decades-old, traditionally volatile, herbicide in 2017 to be used on soybean fields. Monsanto created a soybean seed, Roundup Ready 2 Xtend, that was genetically engineered to withstand applications of dicamba but that killed the surrounding weeds. The problem occurred when the new products accidentally moved on to neighboring fields that did not have the trait Monsanto engineered, leading to symptoms of herbicide damage and nearly 3,000 complaints from areas of the U.S. where soybeans are the king crop. Hager said that in addition to the Xtend trait leading to more dicamba use on soybeans, there were other factors at play that could have contributed to the increased reports of damage, such as a shift in the timing of dicamba applications. “Historically, when dicamba was used in corn there were times when we may not even have soybeans out of the ground yet,” Hager said. The symptoms of dicamba exposure, like cupped leaves, was something that agronomist Stephanie Porter said she saw firsthand near her home in central Illinois last summer. “I could tell it was starting to happen, just by driving past fields I could start seeing symptoms,” Porter said during the panel. A Certified Crop Adviser who previously worked as a diagnostician at the University of Illinois Plant Clinic, Porter travels the state educating farmers about pests, weeds and diseases in corn, soybean and alfalfa production. She said that the damage from dicamba was worse in some parts of the state, particularly the southern portion, than others. Stephanie Porter, a certified crop adviser, speaks at the Champaign Public Library on February 22. “In my version of it, it was because they had really pushed a lot of dicamba seed in that area. They had given really good incentives to spray their herbicide,” Porter said. She said there were fewer losses in other regions of Illinois where growing conditions were better and where they were using different products. “There weren’t as many issues at all. They’re still using Roundup Ready technology up there,” Porter said about northern portions of the state, referencing older glyphosate-resistant soybeans without the dicamba trait. After issues from the 2017 spray season, the U.S. Environmental Protection Agency, which regulates pesticides nationally, updated the new dicamba products' labels to make them restricted use. The restricted use designation means only certified applicators can purchase and use the pesticide. The new label also requires an additional training specific to dicamba in order to mitigate some of the drift issues the companies have attributed to applicators not following the directions on the herbicide’s label. The Illinois Chemical & Fertilizer Association is responsible for coordinating the free training, and Payne said that Illinois has been way ahead of other states in terms of educating applicators. 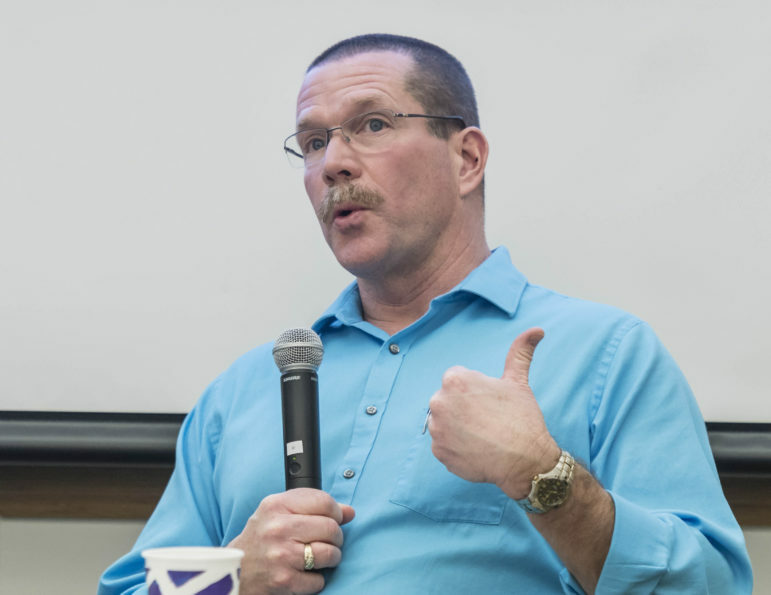 “From the standpoint of awareness, and to the best of our ability preparing people for next year after what we learned this year, we’re in a very good spot,” Payne said. Other states, such as Arkansas and Missouri have placed additional restrictions on dicamba beyond the U.S. EPA requirements. Both states have banned dicamba spraying during certain peak application months. When asked if her association had supported making dicamba a restricted-use pesticide ahead of the 2017 spray season, Payne said that they, “thought that it would be a good approach to take.” She added that to be proactive, the association held a meeting after Indiana had moved in 2016 to make dicamba a restricted-use pesticide in that state. “Because they’re a neighboring state, another agricultural state, our board of directors thought it would be prudent to have a similar discussion with our Illinois Department of Agriculture,” Payne said. In the end, the Department of Agriculture decided to defer to U.S. EPA regulations, reasoning that the additional restrictions in Indiana and Arkansas resulted from differing circumstances in those states, according to Payne. Indiana, for example, was primarily concerned about damage to its tomato crops, and in Arkansas farmers were using older formulations of dicamba on the new Xtend seed.